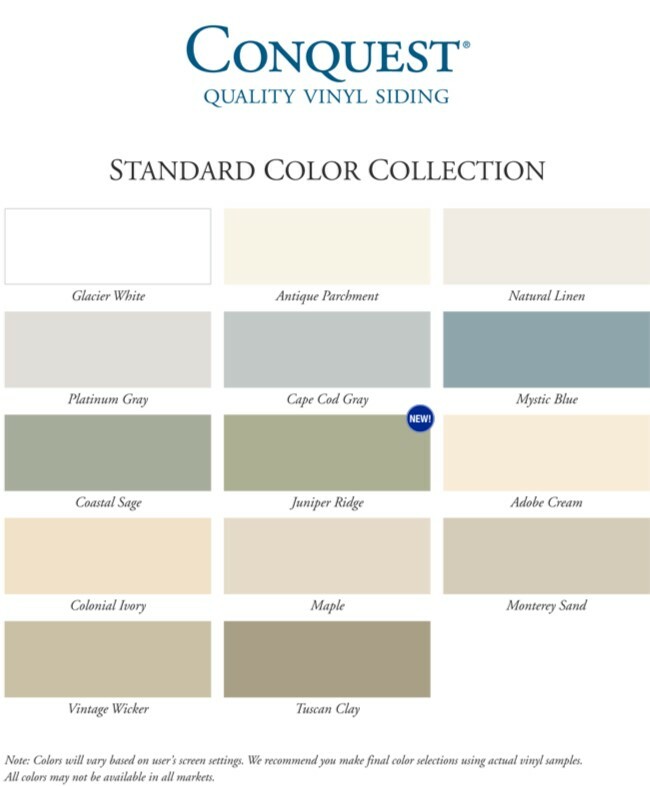 Alside manufacturers superior quality economy vinyl siding. Many different colors, textures, styles and types. Conquest is a competitively priced siding panel that doesn't skimp on appearance or quality. Lifetime Transferable Warranty. Here's the beauty, easy-care convenience and superior quality you demand in your siding. Conquest is a competitively priced siding panel that doesn't skimp on appearance or quality. An occasional rinse with a garden hose will keep the natural cedar grain texture and low-gloss finish beautiful year after year. You don't want just any siding for your home. You want distinction - a home that stands out. Conquest gives you classic beauty that creates dramatic and lasting appeal. Outstanding appearance. Enjoy exceptional look-of-wood beauty with classic 4 1/2" clapboard and Dutch-lap profiles...natural cedar-grain texture, crisp shadow lines and a rich selection of 14 low-gloss colors that look just like painted wood. Save time, save money. No more sanding, staining or painting. no more sanding, staining or painting! Superior quality; Forget costly repairs too, because tough, durable Conquest is made to last. It's also backed a lifetime limited warranty for your protection. Outstanding options: Create a total look for your home with an extensive collection of Alside coordinated exterior design options. Maximum value: You get all this at a price you'll appreciate. Sure, it's going to look like you spent a lot more-but that's what outstanding value is al about. 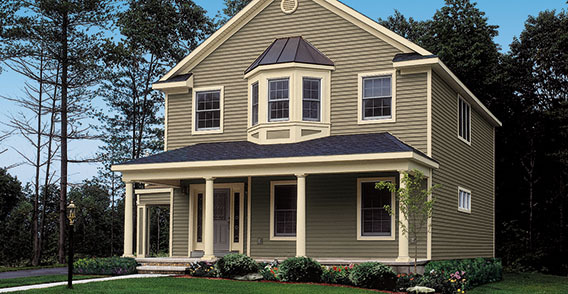 To get more information and a company PDF on Alside Conquest Vinyl Siding, click here. Alside Conquest Vinyl Siding. Contractor Tip: Before you start calling contractors do a little homework first. Look at several different types and styles of vinyl siding and pick out one or two. It saves a lot of time if you know generally what type of siding you are interested in. For more information on how to buy vinyl siding click here. How To Buy Vinyl Siding. 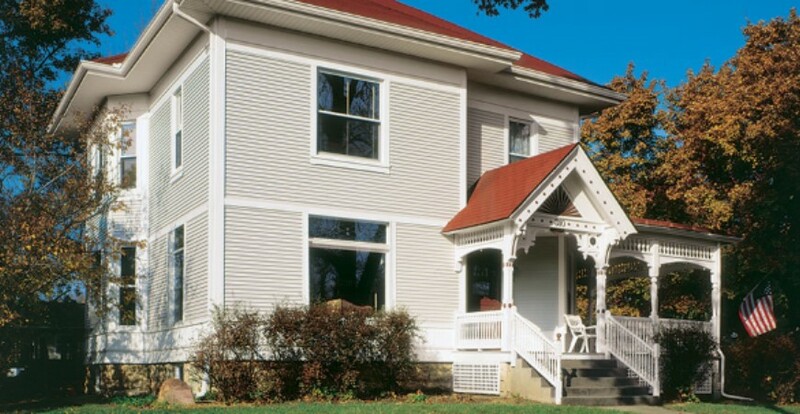 For more information on the many different Types of Vinyl Siding..click here. What Does It Cost to Install Vinyl Siding? What does it really cost to install new vinyl siding on your home? Putting new siding on your house is a process that includes several different components.